Congratulations on your upcoming Celebration. 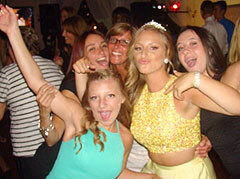 High Energy Entertainment is one of Long Island's top DJ Entertainment Companies. Please take a look at our pages with the different DJ packages. If you have any questions regarding pricing, our music library, or services we offer to make your celebration a great success, please call our office anytime. Ask for Ralph - I will be happy to help you! Best of luck to you on planning your Celebration. We can customize any package to your budget and taste! High Energy is a fully insured Entertainment Company.